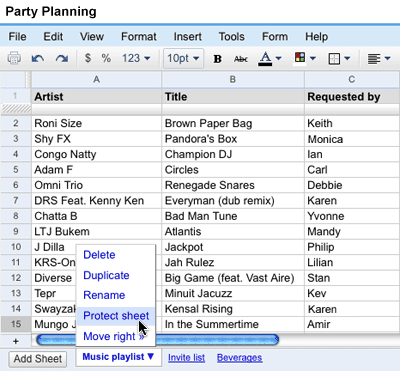 - an additional layer of control over who can edit individual sheets, using the list of people invited as collaborators. Just go to the sheet, bring up the menu, and choose Protect sheet. 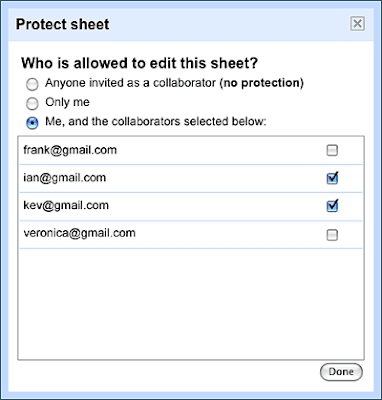 Sheet protection is a great way to add a little fine control over the contents of your spreadsheets. We hope you find it as useful as we have. When working on a spreadsheet together with others, sometimes it's handy to allow some people to modify specific sheets but restrict them from modifying other sheets. Today we've added sheet protection - an additional layer of control over who can edit individual sheets, using the list of people invited as collaborators. Just go to the sheet, bring up the menu, and choose Protect sheet.